A study from Stanford University School of Medicine published in the New England Journal of Medicine in 2012 showed that fit men with or without heart disease live longer that men who are unfit. Not surprisingly, a person’s fitness level is a more powerful predictor of mortality among men than blood pressure, total cholesterol level and history of smoking. Exercise capacity or fitness level has become a strong and independent predictor of heart disease and death. The study supports prior data that absolute peak exercise capacity accurately predicts survival. Patients who are more fit live longer. At OC Sports and Wellness, we can measure your fitness level through a treadmill or stationary bike exercise test. Poor physical fitness is a modifiable risk factor and improvement in fitness over time can improve life expectancy. The testing is performed in our office and the actual test is fast, covered by most insurance plans and very informative. We know of no other medical office in South Orange County that performs fitness testing. We encourage all of our patients to undergo annual fitness testing. 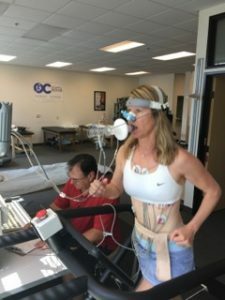 Completing my VO2 Max was very helpful. Saul was great and very insightful. I learned a lot about my health and appreciate the team at OC Sports and Wellness and their vision to help patients achieve better health. I’m looking forward to my follow up VO2 Max in 6 months to see how my performance has improved.